Halloween mystery: Where are girls who vanished 45 years ago? OSCODA, Mich. -- On Oct. 31, 1969, Patricia Spencer and Pamela Hobley had plans similar to many teens in the small town of Oscoda, Mich. - attending their high school's homecoming football game, and then going to a Halloween party. But they never showed up to either, and no one has heard from them since. 45 years later, the search for Pamela and Patricia continues, and family is holding out hope that whoever is responsible for their disappearances can be brought to justice. "I can't move on," Hobley's sister, Mary Buehrle, told 48 Hours' Crimesider. "I just hope that someone knows something and will finally have the guts to say something." That Halloween, the 16-year-old Spencer and 15-year-old Hobley had decided to skip out of class early from their school in Oscoda, a small town in northeast Michigan situated along Lake Huron. Age eight at the time, Buehrle remembers trick-or-treating that evening with her mother, a single mom, and her two other sisters. Pamela had told her family she would be home after attending the game and the party with friends and her boyfriend. It got later, and later. Pamela's boyfriend told the family they were supposed to go out that evening, but that she never showed. As her worried mother called around, they realized her schoolmate Patricia Spencer was also missing. Buehrle insists that her sister would not have run away. While she said she was known to be a "partier," she had everything to look forward to - she was recently engaged to her boyfriend. Buehrle said she believes something horrible happened to the two girls that night. "I believe she's been murdered," Buehrle said. "I think her and Patty were picked up by the wrong person, and they murdered her." Oscoda Township Police Chief Mark David also fears the missing girls became victims of foul play. David hopes finding them would finally bring the family some peace. "If they were able to bury their sisters at least, bring them home, it would be closure for the families," David said. "That's what everyone wants - closure." As an investigator, a major challenge for David has been the age of the case - and the fading memories of those who could have a tip. There've been no major leads since the girls vanished, he said. Since he took over the case in 2010, however, he's gone back and re-interviewed witnesses mentioned in the original police file in an attempt to piece together the girls' last known movements that Halloween. Initially, the girls were last reported seen walking away from Oscoda High School. In May of 2013, however, a witness came forward saying he picked up the girls as they were walking along River Road, which runs alongside the Au Sable River, and dropped the two off in downtown Oscoda. The man said he came forward to police with the information years ago. Chief David has other information to indicate the girls were seen downtown that day. He doesn't believe the man who came forward is involved, he says, nor does he believe Pamela's boyfriend had anything to do with the disappearances. He wouldn't say whether there are suspects in the case, citing the ongoing investigation. Pamela's disappearance has been "a nightmare" for her family, said Buehrle. Though she works as a cook in Hillsdale, Mich., about 250 miles south of Oscoda, she returns to her hometown several times a year and keeps in touch with police on the investigation. Her mother, who moved to Florida, spent her last days with Buehrle in Michigan before she passed away, without knowing what happened to Pamela that day. 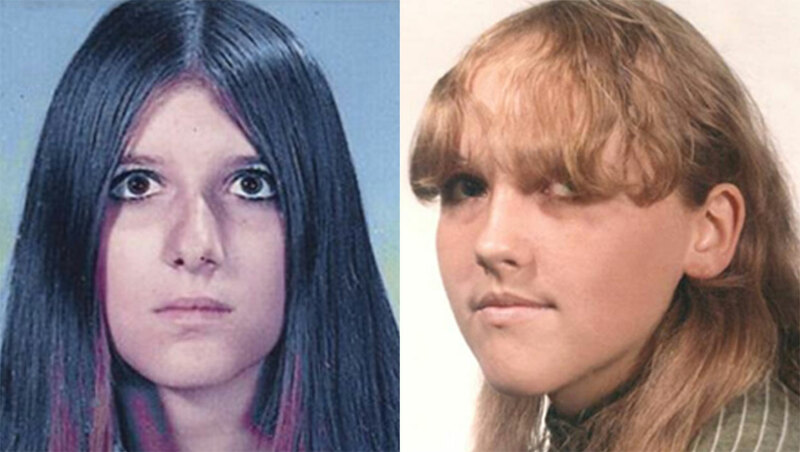 The National Center for Missing and Exploited Children, also involved in the case, has developed age-progressed images for Pamela and Patricia, who would now be 60 and 61. When Pamela disappeared, she was five feet, seven inches tall and 110 pounds with black hair and brown eyes. She had a scar on the left side of her mouth and a scar across the bridge of her nose. Patricia was five feet, four inches tall and weighed 125 pounds. She had brown hair and blue eyes. Though 45 years have passed, David said he believes he can close the cold case. "It's solvable," he said. "I think we can do it." If you have any information about disappearances of Pamela Hobley or Patricia Spencer, please call the National Center for Missing and Exploited Children at 1-800-THE-LOST or the Oscoda Police Department at (989) 739-9113.